Recently articles were published seemingly everywhere stating that the World Health Organisation (WHO) had categorised processed meat as carcinogenic (causes cancer) and that red meat in general ‘probably causes cancer’. The WHO has processed meat in the same category as smoking in relation to cancer risk…. The study which was put forward specifically mentioned colon cancer risk went up by 18% in people who ate 50g of processed red meat (2 slices of bacon) a day compared to none. So firstly I want to bring you back to this 18% figure. This number is a term called ‘relative risk’ which means that the cancer risk between the two studied groups (non processed meat and 50g processed meat) increased by 18%. Actually the figures are an increase in cancer risk from 5.5% to 6.5%. 6.5 is ~18% greater than 5.5 and VOILA, the 18% figure begins floating around. Let’s put this into context. Processed meat which has an 18% relative risk increase in cancer is categorised in the same group as smoking. Now the relative risk increase for smokers compared to non smokers around 2000%. If we used the same control group number of 5.5% then a 2500% relative risk increase would become 115%. Compare that figure to 6.5% and it is incredible that the WHO can even begin comparing processed meat to smoking in relation to cancer risk. Firstly there are some confounding variables (factors which the researchers can’t control which may have an impact on the results) which could be at play here. People who eat higher quantities of processed meat are also more likely to be obese, eat ing in a calorie surplus, inactive, smokers… Therefore you cannot put this increase in risk solely down to processed meat when there are so many confounding variables in play which are also associated with a higher risk in cancer. Secondly red meat should not be associated at all given the risk is clearly even less. Red meat is extremely nutritious providing iron (very important for young women), zinc and many B vitamins. Red meat is a very important component of your diet. Thirdly this is not to say there are no issues with processed red meat. Burning your red meat when cooking can cause Heterocyclic amines (HCAs) and polycyclic aromatic hydrocarbons (PAHs). These chemicals have been found to cause an increased cancer risk through interactions with DNA. The simple thing to do is cut off any charred meat and this can be avoided. Health is not an ‘on’ ‘off’ switch, nor should any single food or lifestyle choice be considered outside the lifestyle as a whole. – Relative risk of processed meat is 18% compared with over 2000% for smoking. – Processed meat consumption associated with obesity, inactivity, smoking and other risk factors. – Red meat is very nutritious and can be an important component of ones diet. – Remove charred section of meat! At present I am training to complete the pre-selection tests for the Royal Marines with the hope of starting basic training as a Royal Marines Officer in September 2016. The following post is one which I recently posted on a Royal Marines forum demonstrating my approach to achieving the fitness levels required to be a Royal Marine Commando/Officer with the hope of helping in their preparation in becoming a Royal Marine. Firstly I will start by demonstrating a standard weekly plan which will aim to cover all areas in which a marine is required to perform well e.g. swimming, bleep test, body weight exercises, running etc. I will also add notes giving information on how to adjust this plan for your needs. People who train habitually (structured, continuous training) have be found to show more improved performance than those who do not. With this in mind I recommend you get yourself a plan to follow. Please note that the following is an example for an individual who is very fit. If you are just starting training and cannot achieve the given distances then start lower and work your way up! Provided you give yourself the appropriate time to prepare this programme should be sufficient for anyone looking to achieve the fitness required for the Royal Marines. If however you are like me and you struggle with an aspect of the training (for me it’s running) or you have very little time to prepare then i suggest you adapt the programme to focus on your weak areas. Bad at running but have good strength: Take out the Heavy Gym day and replace with a running session. Bad strength but a good runner: Take out the Saturday PJFT running session and replace with a gym workout with emphasis upon pull ups, press ups, sit-ups (a variation of the Light Gym session would be good). This is very basic but it will help do the trick. Rest days are essential, especially when you are training frequently at high intensities and with a lot of volume (quantity of exercise being performed). Rest days will maximise your recovery, keep hormone levels normal (testosterone, cortisol, thyroid etc) which are negatively effected when you over-train. This will ensure your performance is optimal throughout your training! Note that the rest days in the plan provided are BEFORE the hardest training days and AFTER the days where you train twice! This is important for the reasons stated above! If bored/restless then go on a 30 minute walk on rest days but no more – not even press ups/pull ups at home. Rest mean rest!! Aim to get around 8 hours of good quality sleep every night. I recommend you train no more than 2 days in a row without a rest day, especially if you are training near a maximum intensity (failure) on those days or if you are training twice a day. This is in order to prevent hormone imbalances (as mentioned in the previous section) and therefore insure your best performance consistently. The majority (90%) of your foods should come from health food sources. Plenty of good carbs (potato, pasta, rice, lentils), protein (eggs, fish, red and white meat, milk) and fats (nuts, olive oil, coconut oil, butter, nut butters, cheese). Keep protein and carb intake fairly high in order to maximise your recovery and performance. Do not restrict yourself too much from ‘junk food’ though especially if you are feeling stressed from the training or your lifestyle as this will just add to that feeling. Just ensure you are eating mainly healthy food. Eat good quality sources of protein and carbohydrates 1-2 hours before your workout. I like to have a coffee pre-workout to keep myself focused. Again, good quality protein and carbs within 1 hour after your workout finishes (this improves recovery time and muscle protein development than if you wait longer). – Whey Protein (normal stuff not Mass Gainer or Diet options). Have a scoop after your workouts and also one before you go to sleep. – Multivitamin. Nothing fancy just a bog standard brand (e.g. ASDA, tesco etc). The difference between cheap and expensive ones is not worth the money. When you are exercising a lot you should not try to diet too hard as this will seriously mess up your hormones, performance and when you eventually start to eat everything you see (because you will fail a hard diet with this type of training) you will put on A LOT of fat quickly. If you wish to lose weight then I advise you track your weight for a week twice a day whilst doing your training programme. If your weight is decreasing then don’t change anything. If it is not going down then you should eat SLIGHTLY less. Your protein requirement INCREASES when you are losing weight in order to maintain muscle mass so I recommend cutting down on carbohydrates and fat depending on which is the most disproportionate high. if you wish to gain weight then you must eat more food, it is that simple. I saw one person recommend drinking a gallon of milk a day (GOMAD) but this is bad advice as that is 4000 calories of milk a day on top of what you are already eating which is way too excessive. However drinking more milk itself is not a bad suggestion. Also i recommend trying to increase calories with healthy food sources mainly consisting of protein and good carbohydrate sources and not from saturated fat sources. NOTE – saturated fat is not bad when consumed in moderation so I am not saying avoid it, just do not overly consume it especially as a large source of calories when trying to gain weight. Pleased to show my first clients progress from after 25 days of working with him. The pictures are 40 days separate however I started training him 25 days prior to the ‘after’ picture. Tom wanted a more rapid fat loss approach and so we went through the details, his lifestyle, how much time he had etc and ended up with the results you can see here. We were even able to accommodate Tom going out and socialising during the weekends. 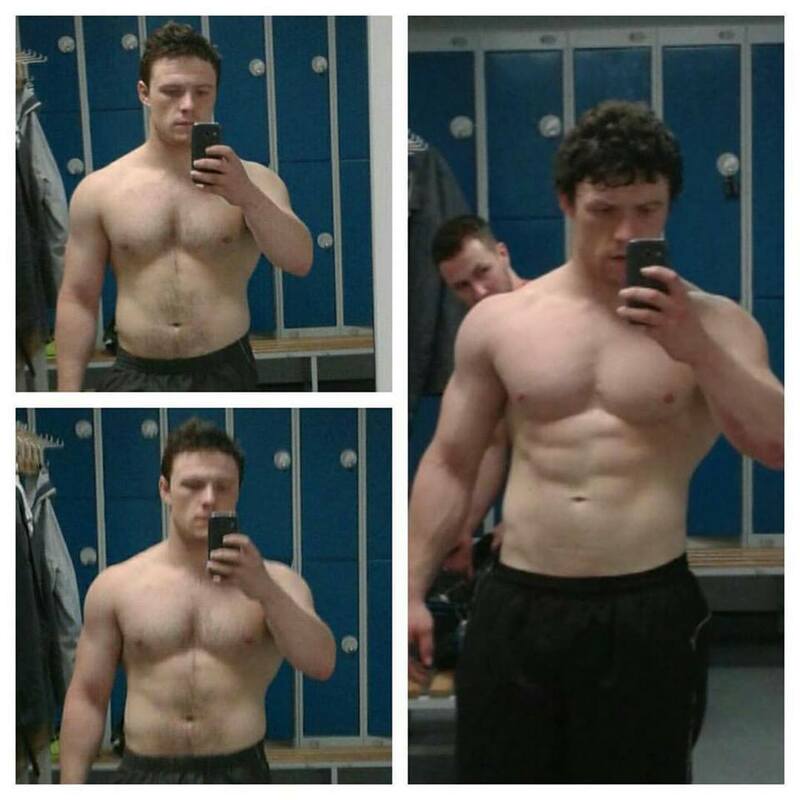 Not only did Tom manage to achieve a lean physique but he also saw improvements in strength and other goals. These are demonstrated by his 5 rep max deadlift increasing from 140 kg to 160 kg and his max muscle ups increasing from 7 to 9 reps. I look forward to showing you more of my clients progress in the future. Before getting into anything I want to say that a diet shouldn’t be short term in the sense that when you eventually stop you go straight back to your original weight. If you can achieve your desired goal then you should strive to maintain that by altering your diet according to your new weight, activity levels etc. You cannot lose weight by eating more calories then you burn, whilst alternatively you cannot gain weight if you eat less calories then you burn in a day. Remember these guidelines are not tailored for you specifically. For example, a very active individual may begin to lose weight at 13 kcals/lb or higher whereas a very inactive individual may need to go as low as 8 or 9 kcal/lb before they start to lose weight. Be smart and keep a track of your progress. protein recommendation: 0.8-1.5 grams/lb total body weight. If you are overweight and exercise infrequently then go towards the lower end. If you are lean and dieting to lose more fat then opt for the upper end. If you are looking to gain weight/muscle then protein requirement is reduced, however I tend to recommend 1 gram/lb for most people, particularly if using a small calorie surplus. 1.5g/lb of protein is a LOT of protein by the way so I recommend adding protein shakes in between, or with, meals to hit those higher figures. Fat & Carbs make up the remaining calories however how you wish to approach this is really up to you. If you train better on higher carb diet (most do) then go for higher carbs hwoever some few people train well on higher fat intakes. 0.45 – 1 grams/lb bodyweight. Go towards the lower end if you are looking to lose weight (simply because its less calories, not because fat makes you fat…). The rest of your calories can be made up of carbs. Firstly variety is key! I usually recommend the larger part of food intake coming from fresh, whole food which isn’t pre-packaged or processed. A variety of food will provide all the nutrition you require. However of course this isn’t always practical and convenient for some families/people so just make the best of your situation. Secondly is meal composition. You should aim to have a good quality source of protein, fat and protein in each meal. Thirdly, in order to get the most anabolic effect from your workouts make sure you eat a meal within 45 minutes of finishing your workout. Also a meal 1-2 hours before workout would be beneficial. These meals should consist of a large portion of your carbohydrate intake and also contain good quality sources of protein (30g minimum to maximise muscle protein synthesis). Finally, meal frequency doesn’t really matter unless you are training towards a specific goal. SEE PICTURE ADDED. Trying to get big fast means you will also put on a lot more fat. There is a limit to how much muscle you can put on at a time. The same is true when trying to lose fat. Give yourself too big a calorie deficit and you will face problems including muscle loss, disrupted hormones such as elevated cortisol, water retention and you will be more likely to fail any diet you are on. The calorie recommendations given in point 1) are based around a 20% difference from your maintenance levels. This is a good figure to go by. 6) be aware that trying to change weight too fast can result in issues so try to be moderate/relaxed in your approach. Current research has shown this to be the ideal rep range for muscle hypertrophy. This means the 3 sets of 10 reps of bicep curls is at the lower end of that rep range (30 total reps). If you did 5 sets of 5 reps of weighted chin-ups/pull-ups before that then you have done enough for the day. If you cannot provide adequate muscle stimulus from that rep range then you are doing something wrong. A lot of people will go to the gym 5/6x each week and training one body part for a full hour. Whilst this may mean you have put in a good workout for that body part this is not optimal for long-term growth. Many people following this plan will find that the weight they can shift on the bar stalls, they just don’t get any bigger and their weight stays the same (though that ultimately comes down to the diet). This is why upper/lower splits (4 days per week training) and full body workouts (2-3 days training) can be popular and effective. In a one hour session you can still hit the ideal rep range for your targeted muscle groups and also train those muscle groups more frequently over the week. Moreover you are gaining extra days for rest, even if you also do further training for sports outside of the gym. More is not always better. Over training is common among people who don’t include rest days and deload weeks in their training plans. Implementing these strategies helps maintain hormonal balance, improve recovery and improve adherence to both training and any dietary strategies you may have. Incorporating a rest day after every 2 consecutive training days and a deload week every 4-6 weeks would be my recommendation. This will greatly improve your long-term results. DOMS (Delayed Onset Muscle Soreness) is the pain/stiffness you feel after training – usually the next day. I read a great article a month or so ago about how many people will train towards getting DOMS not realising that they are impairing their ability to recover or grow. A lot of people think that getting DOMS means they have put in a ‘good’ training session. In reality this is a sign you are over training the muscle and are working it beyond an sensible limit. Take the deltoid (shoulder) for example. This is a notoriously hard muscle to get DOMS in and many people will think that their workout is not sufficient because of this. Feeling ‘slight DOMS’ is a usual effect from training however just because you may not feel DOMS does not mean you have put in a bad workout. Perhaps the most important point. Progressive overload is progressively increasing the weight you are lifting in an exercise – I will add here that this should be with good form. Many people go to the gym and lift the same weight every session and wonder why they are not getting bigger or stronger when they are simply providing the same muscle stimulus over and over. Always try to have a progressive plan. This doesn’t mean chuck extra weight on every single session, nor does it mean dropping your weight and working back up towards it. When you reach the higher end of a rep range you have set (e.g. 8-12 reps) then increase the weight slightly and work towards that higher rep range again, and so on. Quick note- There was more I was thinking of adding such as rep ranges for strength vs hypertrophy, planning towards goals etc but this post was getting lengthy at best and people should know that stuff already. Hope this helps. Why does your diet fail you? The first and, in my opinion, most important issue is that most dieters attempt to be far to rigid in their approach. The problem with this approach is that any slip tends to lead to a complete failure and ultimately results in dieters giving up or restarting the diet all over only to fail again. We’ve all been there when you have 1 cookie and end up inhaling whatever sugary treat you can find within 100 yards of you. By expecting perfection you are doomed to fail. The second issue is focusing only on the short-term. Many people take the approach that the harder they diet, the faster they will lose weight/fat when in reality the amount of fat that can be lost is limited. More (or in this case less) is not always better. Furthermore if an individual manages to reach their goal weight they often revert back to their original exercise and diet habits and regain all that was lost – the body is really good at piling on calories as fat after dieting and if you return to old eating habits you will just watch as the weight comes flying back. The studies of the most successful dieters found that they were able to maintain several consistent behavioral patterns of which a major one is: to keep weight off by maintaining diet and exercise habits in the long-term. The goal of dieting is not to starve yourself and be miserable. Make smaller changes to your diet, give yourself one or two free meals or even a free day during the week to keep yourself sane (this doesn’t mean an excuse to binge though), start an exercise plan that you can maintain long-term and make sure you are eating food you enjoy. If you trip up then just be flexible, put that down as a free day and carry on as usual.